In 1961 the East German government erected a barbed wire fence and then a concrete wall with watchtowers and anti-vehicle trenches in order to stop people escaping from East to West Germany. Some East Germans continued to try to escape over the wall but generally failed: between one and two hundred people were killed in the attempt from 1961 to 1989. Checkpoint Charlie – or, officially, Checkpoint C – was one of the more visible controlled border crossings between East and West Berlin and became something of a tourist attraction for visitors to the western side of the city. 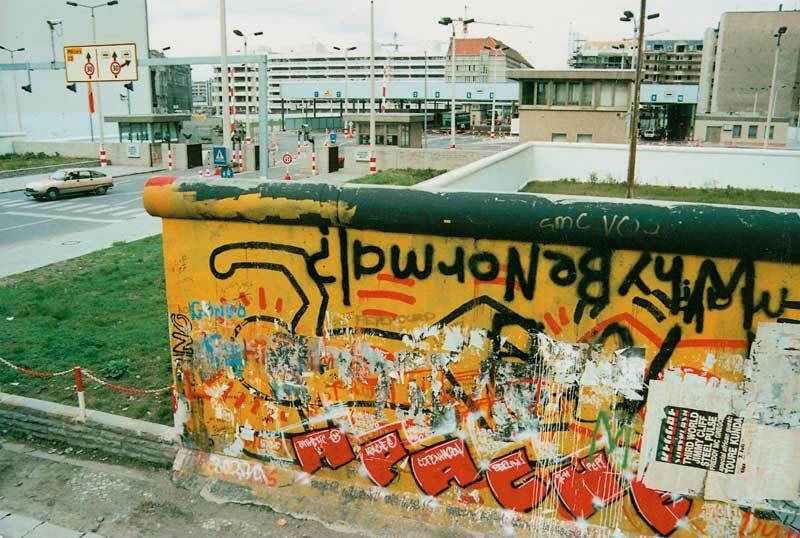 As the years passed, artists and graffitists painted on the western side of the wall, notwithstanding the dangers of antagonising the East German soldiers guarding it (the wall stood a couple of metres inside the East German border). Such acts of defiance and expression of personal freedom became seen in the West as an informal protest against the wall and all it symbolised. Building on this reputation of the Wall as a site of individual dissidence, the Director of the Checkpoint Charlie Museum invited American artist Keith Haring to paint a mural on a section of the wall in 1986. 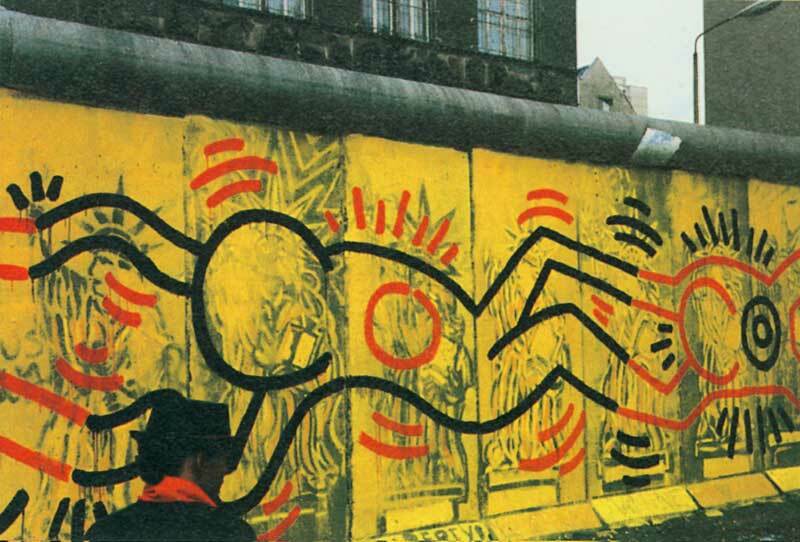 Aware of the historical importance of the wall, Haring, who was visiting Europe at the time, welcomed the opportunity to work on a grand scale in an attempt to ‘destroy the wall through painting it’. One night museum assistants painted a hundred-metre stretch of the wall by Checkpoint Charlie yellow on his instruction, and the next day Haring painted a chain of interlinked figures on the wall. He used the colours of the East and West German flags (black, red and yellow), symbolising the bringing together of the two peoples. Only when the East German guards were satisfied that he was not defaming East Germany was he relatively safe to continue working, though he had technically crossed into East Germany without authorisation. Haring completed the mural in somewhere between four and six hours and the Checkpoint Charlie Museum staff worked hard to publicise the mural, ensuring that Haring’s painting was not just a national but also an international news event across Europe (including East Germany) and America. Haring played a key role in promoting the work, giving interviews and holding a press conference during the day. That night or early the next day, however, someone painted large sections of the mural grey, perhaps in political protest against the upbeat message of the American’s work. Quickly, other artists and graffitists painted on the hundred-metre section that Haring had used. Within months there was very little left to see. Paradoxically, it was not censorship by the East German authorities that Haring needed to have feared but other artists. Three years later, on 9 November 1989 the East German government succumbed to mounting public pressure and announced that East Berliners would be able to travel freely to the West. That evening people on both sides of the wall picked up sledgehammers and started to bring the wall down in what was a momentous step that led to the re-unification of Germany. 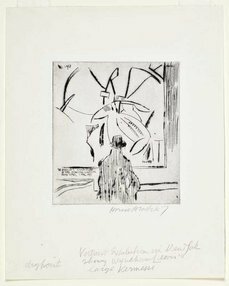 If it is not regarded as ‘sacred’ and ‘valuable’, then I can paint without inhibition, and experience the interaction of lines and shapes. I can paint spontaneously without worrying if it looks ‘good’; and I can let my movement and my instant reaction/response control the piece, control my energy (if there is any control at all) … It is temporary and its permanency is unimportant. Its existence is already established. It can be made permanent by the camera.